“Vermentino is a grape that needs to see the sea,” a winemaker recently told me. But let’s be specific. 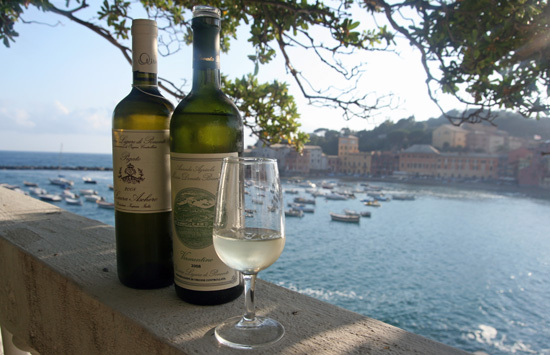 Vermentino craves the Ligurian Sea. I get that. Liguria is my favorite place, too. I never tire of hiking its ancient paths that follow the contours of the rocky cliffs. I love the smells that my feet kick up and the sea breeze carries in: salt air, hot stones baking under the sun, wild fennel and mint, yellow broom and aromatic herbs, pine resin and macchia scrub. Every time I drink Vermentino, these aromas come wafting out of the glass: herbs, minerality, floral notes, even a salty finish (which Italians call sapido). The wine immediately whisks me back to Liguria. During our PIEDMONT & CINQUE TERRE TRAILS hiking tour, I can demonstrate in situ how the wine mirrors the place: We trek on the Riviera cliffs in the morning and taste Vermentino in the evening, our short-term memories lighting up with aroma matches. But Stateside, it isn’t so easy. You simply can’t find the stuff—at least from Liguria There’s too little grown on those steep terraced slopes. So when I wanted to present a Vermentino tasting to my wine club this month, I stuffed a few bottles into my check-in luggage and schlepped them to New York. Next, I went shopping. My idea was to compare Vermentino from the whole Ligurian basin. This plump, thin-skinned, late-ripening grape craves hot, dry maritime climates, so it also flourishes on the coasts flanking Liguria as well—Provence to the west (where the grape is called Rolle) and Tuscany to the east. And it blankets Sardinia, its probable entry point to Italy centuries ago. The prevailing theory is that Vermentino was an Iberian grape (perhaps an offshoot of Malvasia) transported to Sardinia by the ruling Spaniards sometime between 1400 and 1700. Since the Aragon dynasty also brought Garnacha (renamed Cannanou) and Carignan, that’s a logical supposition. But recent DNA analysis has thrown a monkey wrench into this idea, pointing instead to a possible kinship with Furmint in Hungary. The only Vermentino that’s a DOCG comes from Sardinia—the Gallura area on the island’s northern, granite shores. Unfortunately, there was none to be found in New York City. So instead, I brought one of the most readily available—and bargain priced—Vermentinos, Argiolas’s $12 Costamolino. Unlike the more ethereal bouquet of the first two flights, “this wine screams at you,” said one taster. It had an aggressive nose, and its fruit-forward flavors were more tropical than herbal, suggesting pineapple, lemon, and banana. The Tuscan Vermentino was more nuanced, but it paled in comparison with everything before it. Not to be a Johnny One Note, I included some rosés and a red at this Riviera tasting. Provence’s calling card is pale, dry rosé—the more aromatic the better. We tried two styles: First was Miraval’s pale pink rosé made from Cinsault and Grenache. Despite the delicate color, its herbal, savory character packed a powerful punch and won over the entire room. The darker, rose-hued Mas de Gourvonnier was a disappointment, however; I’d liked it before, but today it seemed lacking in flavor and focus. Another suitcase wine. Admittedly, you either love it or hate it. (Napoleon loved it.) And most of the group was captivated by the savory, earthy, fruit-of-the-woods character of Rossese, a twin to Provence’s Tibouren grape. The skeptics were at least intrigued. (No one hated it.) Frankly, I’d happily bring home a case of this Ligurian red every trip. And you need to, since it’s impossible to find in the U.S.
Want to taste in situ? Check out our Piedmont & Cinque Terre Trails wine + hiking tour.